Winemaker’s Notes: This Sauvignon Blanc is pale yellow in color with light green hues. The nose offers tropical fruit like lychee and passion fruit. The fresh mouth is intensely acidic, with mineral notes, delicious texture and creaminess. Long, persistent finish. Pair with oysters and lobster, salad, or octopus carpaccio. My Review: I have a hard time saying no to Chilean Sauvignon Blanc, as it’s long been a go-to for my wife and I during the summer (though it’s slowly being replaced by rose’ and pinot gris). 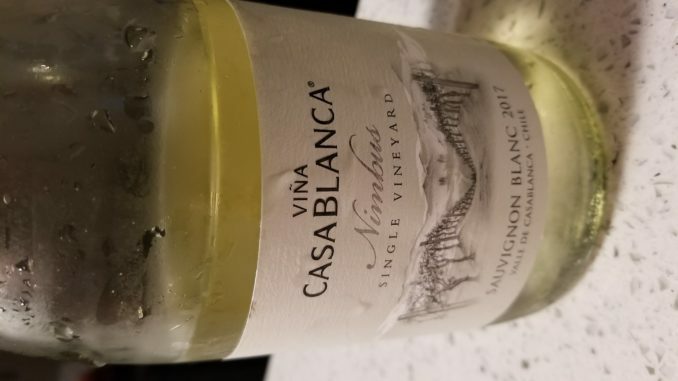 So when I was offered a chance to try the new vintage of Nimbus Sauvignon Blanc from Vina Casablanca, it was hard to turn down. In the glass the wine was a yellow-gold color, and on the nose I picked up light citrus notes, much milder than I’m used to from wines from the area (that’s not a bad thing). In the mouth the wine was crisp, but still showed a surprising amount of body – not to the point of being full or even medium-bodied, but it had a hint of roundness that gave it a bit more character than I was expecting, while still showing the notes of citrus, mineral, and a bit of acid (though softer than usual) that I expect from Sauvignon Blanc from Chile. For $15 I like the wine – it sips really easy, and could easily be paired with food or enjoyed without. There are decent Sauvignon Blancs for less money, but they tend to be one note, high acid and citrus wines that, while certainly enjoyable, don’t offer as much character as this wine, and for only a few dollars less.